Anyway, Photoshop Fix. It's a new photo editor that focuses on quick and easy adjustments to photos, specifically selfies, portraits, and other shots including squishy humans. 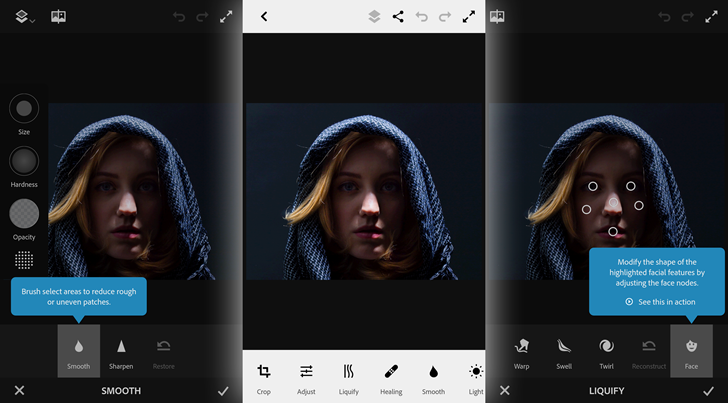 The "liquify" and "smooth" tools are designed to allow for fairly direct face and body improvements for those who want them, while more general image-wide filters and adjustments are present more or less to make the app competitive with the editor built into your phone. And because we live in the Instagram age, it includes vignettes and a defocus tool. More standard photo adjustments like red eye reduction, spot heal, and even a clone stamp are also present. As with all of Adobe's other Android apps, Photoshop Fix integrates with the paid Creative Cloud service, but images can be shared or exported without a license. It does insist that you log in with an Adobe account, though - no Facebook or Google shortcuts, either. The interface works well (by borrowing liberally from other mobile editors, but hey, if it ain't broke), and the app is compatible with Android 5.0 or higher.